When you’re presented with absolute primo fruit you’ve got to go ‘all out’. To really think ‘how can I make the best bloody wine I can’. No shortcuts. Nothing but net. 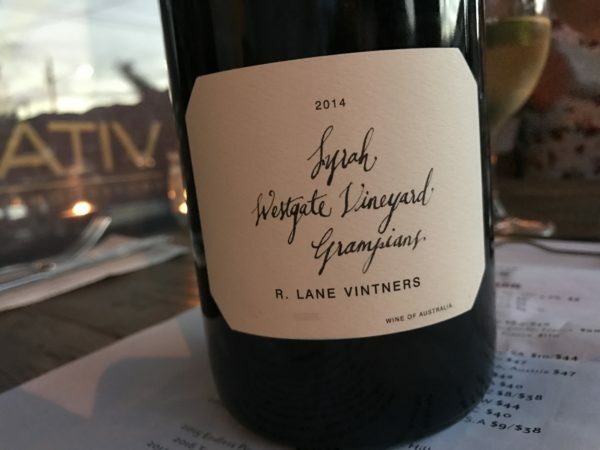 This new Shiraz from Rory Lane (Story Wines) is such a beast. Wild fermented with 60% whole bunches, this is immediately a different wine from previous Story Wines Westgate Shiraz. Rather than the usual plum, there is more white pepper, the aromatics juiced like never before. Blind you’d be forgiven calling this ’15 Yarra rather than ’14 Grampians. Every bit the Syrah mode. Still, underneath it’s driving and tannic, the fruit peaking out to show it’s there, the wine packing an uncommon ‘I’ll live forever’ length. That balance is the clincher – the acidity natural, the mid-weight form unhurried too. I left the bottle in the fridge and 5 days later it was still tight and taut. Top tier Aussie ‘Syrah’ no matter how you look at it. Best drinking: 2020-2030. 18.5/20, 94/100+. 14%, $75. Would I buy it? I’d drink a bottle and wouldn’t mind some in the cellar at all. Would you recommend leaving unfinished bottles of red in the fridge rather than out on the table to make them last longer ? Personally, I always put red wines in the fridge as it slows down the rate of oxidation. Helps them taste fresher, longer. Here’s a tip i have picked up found our options club. Take a 375ml bottle and fill the first half of the bottle you are opening into this. Cap the 375ml and place in the fridge and drink the half of the 750ml originally opened bottle first. Always a fan of this method. Best 375ml bottle IMO is a screwcap sealed sticky. Easy to empty it first time around as well!